On the Saturday morning of the Great American Beer Festival (GABF) weekend, the energy is electrifying. Hundreds of brewers, brewery owners and founders, and others in the craft beer industry sit in the Mile High Ballroom of the Colorado Convention Center, perhaps somewhat anxiously, sipping beers and looking up at the screen in the front of the room, waiting for their beer to be called and named a GABF medal winner. And if they hear it: elation, high-fives and hugs all around. “It’s just a shock. When it hits, it’s just phenomenal,” said Gerald Wyman, whose Gella’s Diner & Lb. Brewing Co. of Hays, KS, won two medals and Small Brewpub of the Year. The largest commercial beer competition in the world, the 2013 Great American Beer Festival competition marked its 27th year with record-breaking participation. A total of 201 judges from 11 countries judged 4,809 beers (a 12 percent increase from 2012) from 732 breweries in 84 categories. There were 230 first-time entrants; 24 of them won awards. The festival and the judging are a way to take stock of the American craft beer industry’s brewers and drinkers, especially during this period of tremendous growth. Tickets for the general public sold out in record time this year—about 20 minutes—and many breweries were initially shut out of the festival after registration filled up in less than two hours. There were repeat victories—veterans like Firestone Walker and Left Hand Brewing tied for the most gold medals won—and relative newcomers like Beachwood Brewing & BBQ, which swooped in with five medals. Brewing hubs Colorado, California and Oregon had the most medal winners by state, but New Mexico and Texas earned 10 and eight medals, respectively. All About Beer Magazine took a look at some of this year’s winners, from a brewpub off I-70 in Kansas, to a brewery in a baseball field, from Virginia to California, and from the large to the very small, to see how they did it. Julian Shrago loves his beer like a proud father. Beachwood—co-owned by Gabe Gordon, Lena Perelman and Shrago—won five medals and the title of Mid-Size Brewpub of the Year. Beachwood has been open for less than three years. Shrago developed two of the recipes—Foam Top Cream Ale (golden or blonde ale category) and Kilgore (American-style stout) as a homebrewer. Udder Love, developed at the pub, was his first milk stout, and it earned a silver in the sweet stout category. Barrel-aged Full Malted Jacket, which won bronze, was first barrel-aged beer that he, and the pub, had ever brewed. System of a Stout, which earned bronze in the coffee beer category, “totally threw me out of my comfort zone,” he said, when he was challenged to brew a beer that tasted like a cup of an Armenian coffee for an Armenian-American friend’s fundraiser at the brewpub. He accomplished it with an imperial oatmeal stout spiced with cardamom, sweetened with molasses and aged on custom roasted coffee in American brandy oak. Shrago is also quick to thank Beachwood’s loyal drinkers and the growing and diversifying Los Angeles craft beer scene. Very Small Brewing Company of the Year: Baker City Brewing Co.
“I’m calmer than I’ve been in months right now,” brewer Marks Lanham of Baker City Brewing Co. and Barley Brown’s Brew Pub of Baker City, OR, said after the GABF awards ceremony, where Baker City won Very Small Brewing Company of the Year. 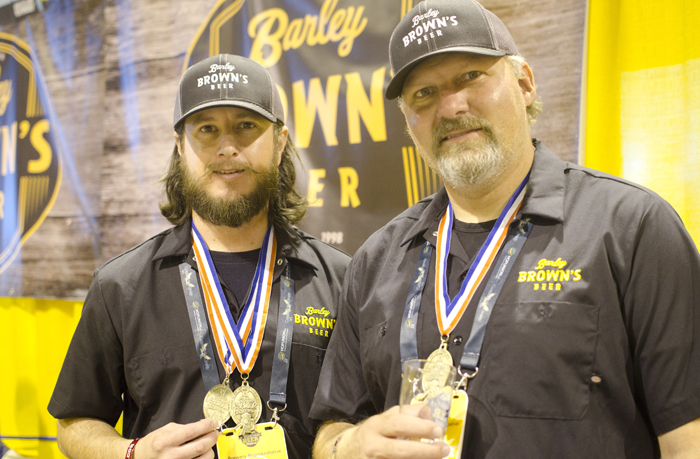 That time must have paid off, as the two breweries won a combined five medals: Barley Brown’s took home gold for Pallet Jack IPA in American-style IPA and bronze for Fresh Hop Pallet Jack for fresh hop ale category and Baker City won gold for Shredder’s Wheat, silver for Hand Truck Pale Ale and silver for Don Vanuchi foreign-style stout. Then there’s the title win for the new category Very Small Brewing Company and Brewers of the Year, Lanham and Eli Dickison. Marks Lanham and Tyler Brown of Baker City Brewing Co. and Barley Brown’s Brew Pub. Photo by Jon Page. Shredder’s Wheat, one of their local favorites, broke the “silver curse” as Lanham put it, after winning silver in the American-style wheat category for the past four years. Then there’s the gold-medal winning Pallet Jack IPA, winner of the largest category, American-style IPA, with 252 entries. Lanham calls the beer, originally designed on Barley Brown’s four-barrel system, a “designer IPA” because it uses proprietary hops that are harder to get on a larger scale—Citra, Simcoe and Amarillo. Given the demand for its beers in Oregon, Barley Brown’s opened Baker City Brewing Co. in March 2013 to produce more of those same beers and share them on a wider distribution. The new brewery, located right across the street from the brewpub, features a 20-barrel system and as they scale up production and get in a full year’s worth of brewing, Lanham said it’s unlikely they’ll be considered “very small” next year. 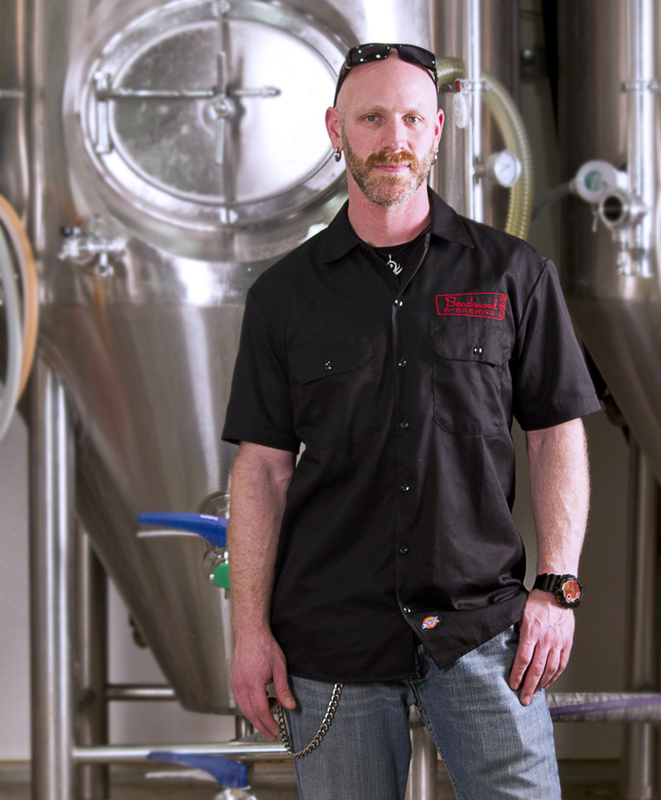 The Denver brewery, helmed by brewmaster John Legnard and his team, won Large Brewing Company and Brewers of the Year, and earned gold medals for Second Hand Smoke (smoke beer) and for Move Back (Dortmunder or German-Style Oktoberfest) and a bronze medal for Goat Rancher (bock category). That brings SandLot’s total GABF medal count to 43. The brewery opened in 1995. A beer sample at The SandLot in Denver. Photo by Jon Page. While the brewery produces only roughly 3,000 barrels of beer a year on its 10-barrel brewing system, SandLot is considered a large brewing company because it is part of MillerCoors. 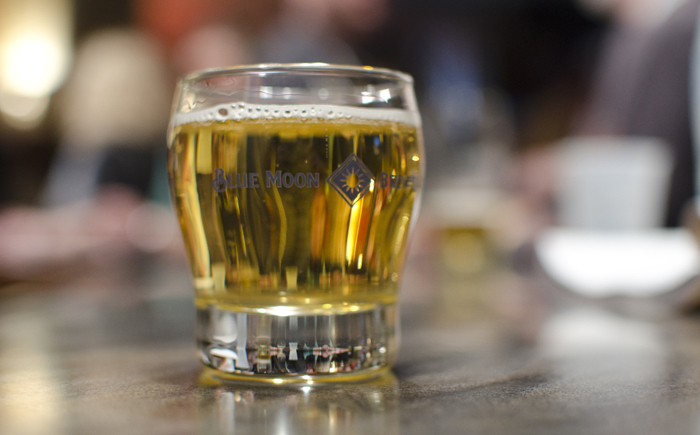 They might brew traditional German-style beers, but the brewing team members do have a more off-beat sense of humor: brewer Tom Hail said the beer he’s most proud of was their European-Style Pilsner, Most Beer Judges are Bone Heads, which won silver in 2005. Being in a baseball stadium poses more logistical challenges than a standard brewery, with the brewing and packaging schedule dependent on whether the game’s home or away. Besides that, though, Hail makes it sound easy. Is it the Culture―or is it the Beer?